Wow Anna! These are amazing!! I love them. Where did you find that awesome wall?? I am building my website right now and a new blog I will let you know when I am done. I am also booked every saturday through Nov ... yeah! my dream is happening. Anyway, for some reason I feel like I should update you or something, but once again ... love these pictures! Anna...I don't even know what to say! I am in awe! You are so stinkin' talented and we had so much fun hanging out with you down in the city. These turned out cuter than I could've ever imagined. Especially considering the subjects you had to work with. :) Marc told me, after we left, that I needed more "mirror time" if I was ever going to be a good serious face model. ha. I'll have to work on that one. :) You did such a great job, I can't wait to see the rest of them! You are amazing once again. And don't worry I am sure our paths will cross in the near future. I don't think I can do much in my life without my talented photographer by my side. What a cutie-pa-tutie family! No wonder her aprons are so dang cute...she just looks in the mirror to find inspiration!!! All three of them are gorgeous and looks like you found some new great spots to shoot, that's great! ok, i'm one of michelle's bff. i am DYING. granted, they are beautiful to begin with... but you did a FABULOUS job capturing them! way to be. I am SUPER impressed with your skills. love 'em, Anna! (and I still love those aprons!)... they look beautiful. You amaze me. I love the connection that you always capture. ...and it was really great to meet you and your cute family. these are all really beautiful, what a gorgeous family and a cutie son they have! Wow is right! These are some of favorites of yours lately (u need to post more!). I LOVE that wall...really love, love, love it!!! Their family is precious!!!!! I have been wanting an apron...I'll go check hers out! I love these. you have such good taste of backgrounds!! Thanks for sharing..
First time commenting, but have been following your blog for awhile. What an adorable family! Love your work and can't wait to see more. 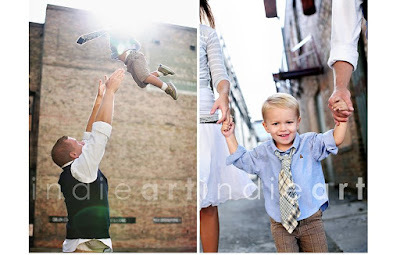 Amazing fam session and what a cute family!